The film is now available for streaming and download on Vimeo in HD! This is something a lot of people have asked for over the last couple of years. If you are one of those people hope you’ll order and also spread the word! Rental for 48 hours is $5, download is $9. 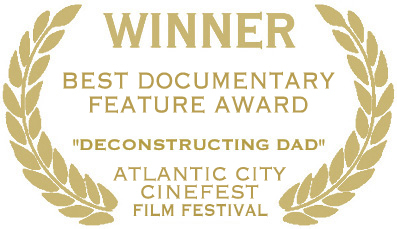 Here’s a link to the order page on Vimeo https://vimeo.com/ondemand/deconstructingdad. And do want to note that that though we all know that streaming is the “future” DVDs are still available and will continue to be–there’s a lot of extra material on the DVD’s that isn’t on Vimeo, so if you want to know even more about Raymond Scott (and perhaps even listen to me try and make sense of my directorial and editorial process in the Director’s Commentary track), keep on reading below. A progress report on the Electronium restoration in Portland, Oregon by engineer Darren Davison. You’ll get good views of the inner components of the machine and Darren explains in detail how things worked, as far as he knows — he’s still figuring it out and the process is very much a work in progress. An interview with John Cool, an electrical engineer who formed a company with Raymond Scott in the early 1970s. The company was meant to manufacture some of Raymond Scott’s many ideas for music related electronic devices. He has fascinating tales to tell about Raymond Scott and the mixed results of their business venture, hosting him for Christmas and listening to him compose one tune after another instantly at the piano (kind of like the human Electronium) and much more. There’s a Directors Commentary, get the story behind the story. • MOOG synthesizer co-inventor, Herb Deutsch, recalls Scott describing the Electronium. There’s about 30 minutes of extras total on the Deluxe DVD. Check-out viewer comments below, and click here for a compendium of reviews and comments. Click HERE to order the Deluxe DVD from Kunaki DVD which we slightly prefer as it makes record keeping easier, and Paypal does charge us a lot for their service, which is why the price is a bit higher. Order through Paypal HERE. The current price is $22.00 for the Deluxe DVD, $22.75 via PayPal. Click HERE to order the original DVD from Kunaki DVD , which we slightly prefer as it makes record keeping easier, and Paypal does charge us a lot for their service, which is why the price is a bit higher, at least for the time being. If you’d prefer to use PayPal, click: HERE. The current price is $17.00 for the Original DVD, $17.75 via PayPal. Even if you’ve seen the film at a screening or via VOD, there’s a lot more on the DVD (and you’ll be helping support the film). The DVD is NTSC region-free, the film run time is 98 minutes. Also, we now have other merchandise like film and Electronium T-shirts and a coffee mug available via our “Merch Table” page, click HERE to have a look. Stan,I’m so glad you’ve completed the DVD production. I thoroughly enjoyed watching it; you did a fantastic job! I came away with an insight into your father’s personality and how it affected his career and relationships. More importantly, you chronicled his many accommplishments, and left no doubt that he truly was a genius. The tempo of the film and your organization of the material, kept the viewer’s interest throughout. Congratulations it is a wonderful tribute to your father. 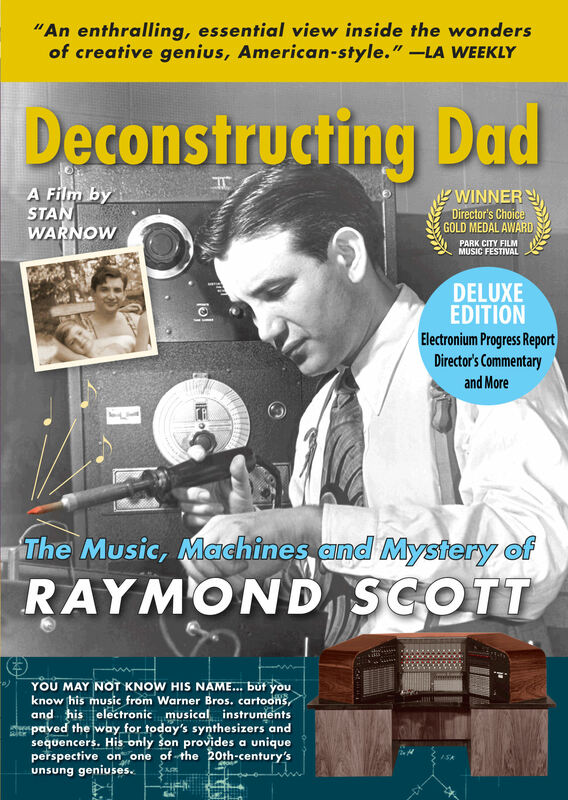 Because of your effort, I am sure many people will come to know of Raymond Scott. IS THE DVD REGION FREE? Yes–it’s region free NTSC Video…. I received the DVD yesterday and watched it this morning – really fascinating film, all the way through. Great job putting it together! I loved it. Thanks so much. An attempt is currently being made to restore the Electronium to working-order. Thank you for that outstanding documentary! I have enjoyed watching it and will now enjoy your father’s music even more. I can’t wait to see this dvd. I’ll order soon. I would really love to see this in theaters, but so far it looks like it has only screened in the Netherlands (Sept 17). Would it be possible to list where it will be screening? Great film!! !, I love it. I’ve done, as far as I know, the first review of the Deconstructing Dad DVD in spanish on my blog. Received Friday. Watching it for the second time and came on here to order for my (ex!) father in law Robert S. Cooper, lute maker, musician. I’ll watch it again when I can- on deadline right now, but this is so rich and inspirational. Rock on Warnow family. P. S. I think there is material for a part 2. Thank you Stan, for a glimpse into the life of one of my musical heroes. Can’t wait for the DVD to arrive in the mail. Need a digital download (filmbaby is a good method). Shipping to Egypt is too much with a 50% chance of it getting lost in the mail anyway . . .
Great DVD! Loved the whole thing,…..it fully added to my understanding of your father’s music and life. Thanks for sharing it with us. Happy 2011 to you and yours! Just saw the documentary screened in Portland–learned so much and want to thank you for putting this amazing and honest history together. would like to screen this as part of the arts event season I run here in the north of the UK. Who do I need to talk to ? Thank you so much for bringing your wonderful DVD of the life and works of your dad to light. It brought remembrances to me that were touching, and your portrayal of Raymond the man, musician, inventor, ring completely true to my vivid recollections of him. He was a valued friend, and valuable mentor, whose intelligence and musicality I miss to this day . . .
Hey Graham–thanks for your interest. A UK theatrical release is unlikely though that would be great–the film was shown at the Glasgow and Sensoria festivals awhile back. But you can order the DVD on this page–it is in NTSC video format but should play on any modern UK DVD player as I believe they are all now multi-format, and certainly should play on your computer. Let me know if you have any other questions…. This DVD looks and sounds very promising – are there any subtitles, English or otherwise? Hi and thanks for your inquiry–unfortunately there are no subtitled versions, though if there were enough demand it would be possible, what languages are you interested in? Are you thinking of English closed captioning or ??? Did he have a brother. I remeber meeting 2 Warnows when I was a kid. I`m Sidney and I’m writing from São Paulo, Brazil! I’d like to know if you could send the DVD to Brazil because I’d like to buy it! Glad to know about it!! Is the Deluxe DVD a properly pressed DVD replicated/manufactured from a glass master or is it made on-demand using (cheap) recordable DVD media? Reason is that minimum runs for glass master pressing are usually 1000, and I was originally doubtful I could sell anything near that, and have heard depressing stories about filmmakers spending their limited funds to order 1000 replicated DVD’s and ending up with boxes full of ones they couldn’t sell filling up their closets. Fortunately after 3 years I have sold more than 1000, but there was no way of knowing that in advance. As Amazon writes in their description about CreateSpace it “enables Amazon.com to offer music and video content that might not otherwise be available.” Totally applies to my film. As far as longevity goes, estimates vary as DVD’s haven’t been around long enough to know for sure how serious degradation will be. The main factors are handling them correctly, scratches, dust and fingerprints will cause far more problems for DVD reliability over the short and medium term (0-20 years in my opinion) than media degradation–as long as the media is stored correctly. I recently replayed the first DVD I ever made myself in 2007, (6 years ago) and it still plays perfectly. And I’ve had playback problems with studio produced feature films on DVDs that come from glass masters. DVD’s haven’t been along enough to establish long term baseline data, but I’ve read plenty of reports suggesting DVD-R’s can last anywhere from 20-100 years, and this seems perfectly reasonable to me–and bear in mind that nothing lasts forever, including celluloid, magnetic tapes, optical media, hard drives etc. But let’s revisit this in 15-20 years and see what’s happened–I’m certainly interested to know! Hope this helps clarify how you feel…. Hi Stan. I rewatched this DVD last night and enjoyed it even more this time around. Your father was a fascinating individual and a dreamer whose imagination could not be contained, only expressed in his music. I intend to purchase some of his music as soon as I can. Thank you so much for making this movie and revealing your father’s genius to a new generation. Pierre-thanks so much for your kind words, they mean a lot to me. And of course especially gratifying to know you watched twice! Any chance you could put this up on Vimeo as a pay to view? Well, great timing on that inquiry (hint, hint). Stay tuned for news about that very soon, and I do mean very…. When clicking one of the links above for ordering the DVD, only the “normal” DVD appears in the shop, not the Deluxe-Version. Is there only the Deluxe-Version to be shipped these days? I saw the documentary a few years ago in a screening in Berlin. So, I am really interested in the additional content. Jan–thanks for info. But as far as I can tell both versions are available on the DVD/VOD page. For some reason even though I just changed the colors the links for the Deluxe Version are not appearing in a different color than normal text, so I can understand why you might think they aren’t active, but they are working, as well as for the original version. Just click on the CAPTIALIZED “HERE” where indicated for either buying the Deluxe Version sirect from Kunaki or via Paypal payment. Sorry for the inconvenience, and let me know if any more problems. Thanks for supporting truly independent film….